When President William Howard Taft was added to an exclusive, Mount Rushmore-only lineup of Racing Presidents more than two years ago, it was big news. There was hype. There was anticipation. Leave it to a president nicknamed "Silent Cal" to just kind of show up. 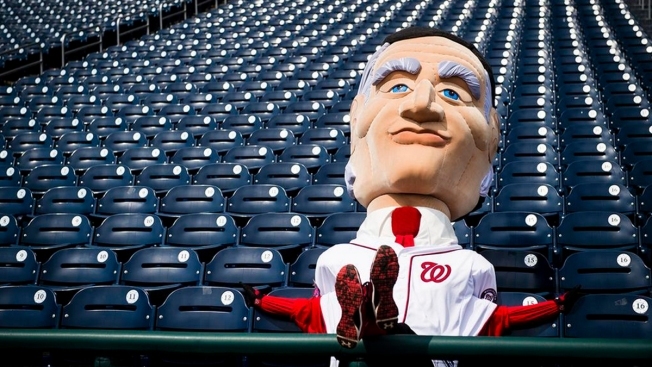 The Washington Nationals revealed with little fanfare on Twitter that Calvin Coolidge will be the latest to join their team of presidential mascots Wednesday, making the announcement with a photo showing the 30th president (in mascot form, that is) kicking back in a seat at Nats Park. "Ladies & gents, please meet the newest #Nats Racing President: Calvin Coolidge!" read the accompanying text. "Welcome to The Show, Calvin." The team of Racing Presidents was just four players strong when it debuted in 2006, comprised of George Washington, Thomas Jefferson ("Tom"), Abraham Lincoln ("Abe") and Theodore Roosevelt ("Teddy"), all four of whom are depicted on Mount Rushmore. Taft, otherwise known as "Bill," was added to the lineup in the 2013-2014 season. The real (non-mascot) President Taft was the first president to throw out a pitch on Opening Day. According to the White House Historical Association, Coolidge was also a big supporter of baseball, calling it "our national game." He attended 10 games as president, including four World Series games -- still the most of any sitting president, says the historic association. Coolidge threw out six first pitches for the Washington Senators, including pitches at the 1924 and 1925 World Series. And on Oct. 1, 1924, he addressed the Washington Senators on the White House lawn after they won their first American League pennant. Some of "Calvin's" fellow teammates welcomed him via Twitter on Wednesday. "Did you hear the news?! Calvin Coolidge has himself a pair of running shoes," Teddy tweeted. "See you on the track, Calvin!" "Hey, hey! No longer the new kid. Our newest competition, Calvin. Think he can keep up with us, @Teddy26Nats??" wrote Bill.